There is a secret ingredient in these cookies. Are you ready for it? Weird, right? You don’t taste it at all, but it really does something special for the texture of the cookie. It becomes more of a soft batch cookie, super tender and melt-in-your-mouth-like, but still crisp enough on the outside to provide some contrast. The other super essential ingredient in these cookies are these (relatively) new chips offered by Nestle, called DelightFulls. They have gooey caramel inside a milk chocolate chip and they are like crack, I tell you. They are like my favorite chocolate candy ever and I eat them straight. 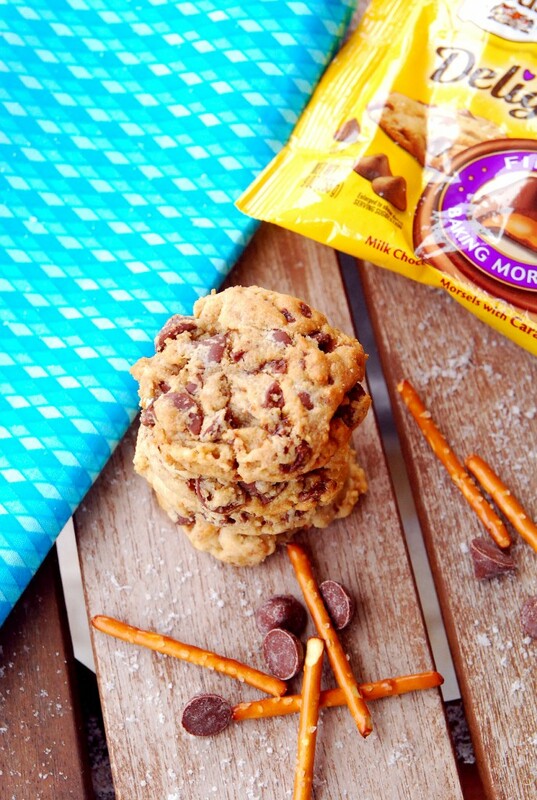 They are perfect in this cookie surrounded by salty pretzel chunks. These would make your Valentine very, very happy. Use an electric mixer to combine butter, cream cheese, sugars, egg, vanilla, and beat on medium-high speed until well-creamed, light and fluffy, about 5 minutes. In a separate bowl, combine the flour, cornstarch, baking soda, salt. Preheat oven to 350F, line a baking sheet with a silpat or parchment. Scoop chilled dough into heaping tablespoons and flatten slightly. Place on cookie sheets spaced at least 2 inches apart. Bake for 8 to 9 minutes, or until edges have set and tops are just beginning to set, even if slightly undercooked, pale and glossy in the center. Do not bake longer than 10 minutes as cookies will firm up as they cool. 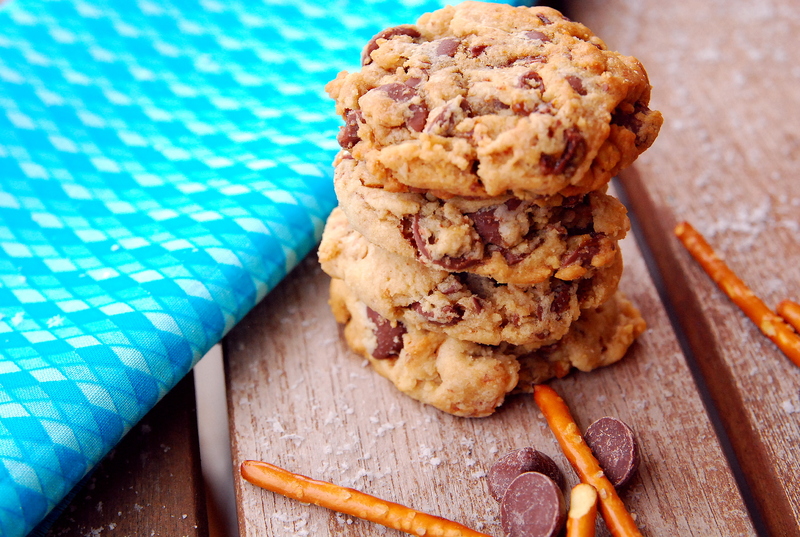 Allow cookies to cool on the baking sheet for 5 minutes before removing and transferring to a rack to finish cooling.